German Chancellor Angela Merkel is expected to embark on a 2-day visit to Athens on January 10th. 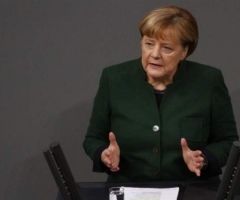 Merkel, who recently handed over the leadership of the Christian Democratic Union, will meet with Greek President Prokopis Pavlopoulos, Prime Minister Alexis Tsipras and main opposition chief Kyriakos Mitsotakis. According to sources in Berlin, the visit’s main objective is to convey a positive message following Greece’s exit from the bailout programs. The timing of her visit also appears to hinge on regional developments in the Balkans. Merkel will most probably support Greece’s leftist premier ahead of an expected parliamentary vote on the name deal with the Former Yugoslav Republic of Macedonia. The implementation of the third bailout deal by the second SYRIZA-led administration and cooperation on the migration crisis strengthened ties between the two leaders following a serious rupture caused by Tsipras’s decision to call a bailout referendum in 2015.